"Also sprach Zarathustra" redirects here. For other uses, see Also sprach Zarathustra (disambiguation). Thus Spoke Zarathustra: A Book for All and None (German: Also sprach Zarathustra: Ein Buch für Alle und Keinen, also translated as Thus Spake Zarathustra) is a philosophical novel by German philosopher Friedrich Nietzsche, composed in four parts written between 1883 and 1885 and published between 1883 and 1891. Much of the work deals with ideas such as the "eternal recurrence of the same", the parable on the "death of God", and the "prophecy" of the Übermensch, which were first introduced in The Gay Science. 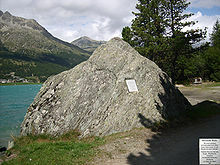 Nietzsche wrote in Ecce Homo that the central idea of Zarathustra occurred to him by a "pyramidal block of stone" on the shores of Lake Silvaplana. Thus Spoke Zarathustra was conceived while Nietzsche was writing The Gay Science; he made a small note, reading "6,000 feet beyond man and time", as evidence of this. More specifically, this note related to the concept of the eternal recurrence, which is, by Nietzsche's admission, the central idea of Zarathustra; this idea occurred to him by a "pyramidal block of stone" on the shores of Lake Silvaplana in the Upper Engadine, a high alpine region whose valley floor is at 6,000 feet (1,800 m). Nietzsche planned to write the book in three parts over several years. He wrote that the ideas for Zarathustra first came to him while walking on two roads surrounding Rapallo, according to Elisabeth Förster-Nietzsche in the introduction of Thomas Common's early translation of the book. Although Part Three was originally planned to be the end of the book, and ends with a strong climax, Nietzsche subsequently decided to write an additional three parts; ultimately, however, he composed only the fourth part, which is viewed to constitute an intermezzo. The original text contains a great deal of word-play. An example of this is the use of words beginning über ("over" or "above") and unter ("down" or "below"), often paired to emphasise the contrast, which is not always possible to bring out in translation, except by coinages. An example is Untergang, literally "down-going" but used in German to mean "setting" (as of the sun) but also "sinking", "demise", "downfall" or "doom"; which Nietzsche pairs with its opposite Übergang (meaning "transition", literally "over-going"). Another example is Übermensch (overman or superman), discussed later in this article. The book chronicles the fictitious travels and speeches of Zarathustra. Zarathustra's namesake was the founder of Zoroastrianism, usually known in English as Zoroaster (Avestan: Zaraϑuštra). Nietzsche is clearly portraying a "new" or "different" Zarathustra, one who turns traditional morality on its head. He goes on to characterize "what the name of Zarathustra means in my mouth, the mouth of the first immoralist:"
For what constitutes the tremendous historical uniqueness of that Persian is just the opposite of this. Zarathustra was the first to consider the fight of good and evil the very wheel in the machinery of things: the transposition of morality into the metaphysical realm, as a force, cause, and end in itself, is his work. [...] Zarathustra created this most calamitous error, morality; consequently, he must also be the first to recognize it. [...] His doctrine, and his alone, posits truthfulness as the highest virtue; this means the opposite of the cowardice of the "idealist” who flees from reality [...]—Am I understood?—The self-overcoming of morality, out of truthfulness; the self-overcoming of the moralist, into his opposite—into me—that is what the name of Zarathustra means in my mouth. Zarathustra has a simple characterisation and plot, narrated sporadically throughout the text. It possesses a unique experimental style, one that is, for instance, evident in newly invented "dithyrambs" narrated or sung by Zarathustra. Likewise, the separate Dionysian-Dithyrambs was written in autumn 1888, and printed with the full volume in 1892, as the corollaries of Zarathustra's "abundance". Zarathustra also contains the famous dictum "God is dead", which had appeared earlier in The Gay Science. In his autobiographical work Ecce Homo, Nietzsche states that the book's underlying concept is discussed within "the penultimate section of the fourth book" of 'The Gay Science' (Ecce Homo, Kaufmann). It is the eternal recurrence of the same events. Another singular feature of Zarathustra, first presented in the prologue, is the designation of human beings as a transition between apes and the "Übermensch" (in English, either the "overman" or "superman"; or, superhuman or overhuman. English translators Thomas Common and R. J. Hollingdale use superman, while Kaufmann uses overman, and Parkes uses overhuman. Martin has opted to leave the nearly universally understood term as Übermensch in his new translation). The Übermensch is one of the many interconnecting, interdependent themes of the story, and is represented through several different metaphors. Examples include: the lightning that is portended by the silence and raindrops of a travelling storm cloud; or the sun's rise and culmination at its midday zenith; or a man traversing a rope stationed above an abyss, moving away from his uncultivated animality and towards the Übermensch. I teach you the overman. Man is something that shall be overcome. What have you done to overcome him?" "All beings so far have created something beyond themselves; and do you want to be the ebb of this great flood and even go back to the beasts rather than overcome man? What is the ape to man? A laughingstock or a painful embarrassment. And man shall be just that for the overman: a laughingstock or a painful embarrassment. You have made your way from worm to man, and much in you is still worm. Once you were apes, and even now, too, man is more ape than any ape." "Whoever is the wisest among you is also a mere conflict and cross between plant and ghost. But do I bid you become ghosts or plants?" "Behold, I teach you the overman! The overman is the meaning of the earth. Let your will say: the overman shall be the meaning of the earth! I beseech you, my brothers, remain faithful to the earth, and do not believe those who speak to you of otherworldly hopes! Poison-mixers are they, whether they know it or not. Despisers of life are they, decaying and poisoned themselves, of whom the earth is weary: so let them go! 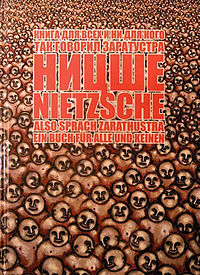 Since many of the book's ideas are also present in his other works, Zarathustra is seen to have served as a precursor to his later philosophical thought. With the book, Nietzsche embraced a distinct aesthetic assiduity. He later reformulated many of his ideas in Beyond Good and Evil and various other writings that he composed thereafter. He continued to emphasize his philosophical concerns; generally, his intention was to show an alternative to repressive moral codes and to avert "nihilism" in all of its varied forms. While Nietzsche injects myriad ideas into the book, a few recurring themes stand out. The overman (Übermensch), a self-mastered individual who has achieved his full power, is an almost omnipresent idea in Thus Spoke Zarathustra. Man as a race is merely a bridge between animals and the overman. The eternal recurrence, found elsewhere in Nietzsche's writing, is also mentioned. "Eternal recurrence" is the possibility that all events in one's life will happen again and again, infinitely. The embrace of all of life's horrors and pleasures alike shows a deference and acceptance of fate, or Amor Fati. The love and acceptance of one's path in life is a defining characteristic of the overman. Faced with the knowledge that he would repeat every action that he has taken, an overman would be elated as he has no regrets and loves life. Opting to change any decision or event in one's life would indicate the presence of resentment or fear; contradistinctly the overman is characterized by courage and a Dionysian spirit. The will to power is the fundamental component of the human identity. Everything we do is an expression of the will to power. The will to power is a psychological analysis of all human action and is accentuated by self-overcoming and self-enhancement. Contrasted with living for procreation, pleasure, or happiness, the will to power is the summary of all man's struggle against his surrounding environment as well as his reason for living in it. Many criticisms of Christianity can be found in Thus Spoke Zarathustra, in particular Christian values of good and evil and its belief in an afterlife. The basis for his critique of Christianity lies in the perceived squandering of our earthly lives in pursuit of a perfect afterlife, of which there is no evidence. This empiricist view (denial of afterlife) is not fully examined in a rational argument in the text, but taken as a simple fact in Nietzsche's aphoristic writing style. Judeo-Christian values are more thoroughly examined in On the Genealogy of Morals as a product of what he calls "slave morality". The image of the Fig is very important in Thus Spoke Zarathustra and it is a reoccurring symbol. For example the main export of the Blessed Islands is Figs and Olives which have long roots symbolic of the tightrope from the prologue. Noteworthy for its format, the book comprises a philosophical work of fiction whose style often lightheartedly imitates that of the New Testament and of the Platonic dialogues, at times resembling pre-Socratic works in tone and in its use of natural phenomena as rhetorical and explanatory devices. It also features frequent references to the Western literary and philosophical traditions, implicitly offering an interpretation of these traditions and of their problems. Nietzsche achieves all of this through the character of Zarathustra (referring to the traditional prophet of Zoroastrianism), who makes speeches on philosophic topics as he moves along a loose plotline marking his development and the reception of his ideas. This characteristic (following the genre of the Bildungsroman) can be seen as an inline commentary on Zarathustra's (and Nietzsche's) philosophy. All this, along with the book's ambiguity and paradoxical nature, has helped its eventual enthusiastic reception by the reading public, but has frustrated academic attempts at analysis (as Nietzsche may have intended). Thus Spoke Zarathustra remained unpopular as a topic for scholars (especially those in the Anglo-American analytic tradition) until the second half of the twentieth century brought widespread interest in Nietzsche and his unconventional style that does not distinguish between philosophy and literature. It offers formulations of eternal recurrence, and Nietzsche for the first time speaks of the Übermensch: themes that would dominate his books from this point onwards. The critic Harold Bloom, writing in The Western Canon (1994), criticized Thus Spoke Zarathustra, calling the book "a gorgeous disaster" and "unreadable". Other commentators have suggested that Nietzsche's style is intentionally ironic for much of the book. This irony relates to an internal conflict of Nietzsche's: he hated religious leaders but perceived himself as at least somewhat akin to one. The first English translation of Zarathustra was published in 1896 by Alexander Tille. Thomas Common published a translation in 1909 which was based on Alexander Tille's earlier attempt. Common wrote in the style of Shakespeare or the King James Version of the Bible. Common's poetic interpretation of the text, which renders the title Thus Spake Zarathustra, received wide acclaim for its lambent portrayal. Common reasoned that because the original German was written in a pseudo-Luther-Biblical style, a pseudo-King-James-Biblical style would be fitting in the English translation. The Common translation remained widely accepted until more critical translations, titled Thus Spoke Zarathustra, were published by Walter Kaufmann in 1954, and R.J. Hollingdale in 1961, which are considered to convey more accurately the German text than the Common version. Kaufmann's introduction to his own translation included a blistering critique of Common's version; he notes that in one instance, Common has taken the German "most evil" and rendered it "baddest", a particularly unfortunate error not merely for his having coined the term "baddest", but also because Nietzsche dedicated a third of The Genealogy of Morals to the difference between "bad" and "evil". This and other errors led Kaufmann to wonder whether Common "had little German and less English". The translations of Kaufmann and Hollingdale render the text in a far more familiar, less archaic, style of language, than that of Common. Thomas Wayne, an English Professor at Edison State College in Fort Myers, Florida, published a translation in 2003. The introduction by Roger W. Phillips, Ph.D., says "Wayne's close reading of the original text has exposed the deficiencies of earlier translations, preeminent among them that of the highly esteemed Walter Kaufmann", and gives several reasons. Clancy Martin's 2005 translation opens with criticism and praise for these three seminal translators, Common, Kaufmann and Hollingdale. He notes that the German text available to Common was considerably flawed, and that the German text from which Hollingdale and Kaufmann worked was itself untrue to Nietzsche's own work in some ways. Martin criticizes Kaufmann for changing punctuation, altering literal and philosophical meanings, and dampening some of Nietzsche's more controversial metaphors. Kaufmann's version, which has become the most widely available, features a translator's note suggesting that Nietzsche's text would have benefited from an editor; Martin suggests that Kaufmann "took it upon himself to become his [Nietzsche's] editor". Graham Parkes describes his own 2005 translation as trying "above all to convey the musicality of the text". In 2006, Cambridge University Press published a translation by Adrian Del Caro, edited by Robert Pippin. The book inspired Richard Strauss to compose the tone poem Also sprach Zarathustra, which he designated "freely based on Friedrich Nietzsche". Zarathustra's Roundelay is set as part of Gustav Mahler's Third Symphony (1895–6), originally under the title What Man Tells Me, or alternatively What the Night Tells Me (Of Man). Frederick Delius based his major choral-orchestral work A Mass of Life (1904–5) on texts from Thus Spoke Zarathustra. The work ends with a setting of Zarathustra's roundelay which Delius had composed earlier, in 1898, as a separate work. Another setting of the roundelay is one of the songs of Lukas Foss's Time Cycle for soprano and orchestra (1959–60). Carl Orff also composed a three-movement setting of part of Nietzsche's text as a teenager, but this work remains unpublished. The short score of the third symphony by Arnold Bax originally began with a quotation from Thus Spoke Zarathustra: ‘My wisdom became pregnant on lonely mountains; upon barren stones she brought forth her young’. Latin American writer Giannina Braschi wrote the philosophical novel United States of Banana based on Walter Kaufman's translation of Thus Spoke Zarathustra; in it, Zarathustra and Hamlet philosophize about the liberty of modern man in a capitalist society. Italian progressive rock band Museo Rosenbach released in 1973 the album Zarathustra, with lyrics referring to the book. Also Sprach Zarathustra is referenced in the Xenosaga video game series, even making it into the title of Xenosaga Episode III: Also Sprach Zarathustra. The plot covers similar topics that Friedrich Nietzsche covers in his writings. The English translation of part 2 chapter 7 "Tarantulas" have been narrated by Jordan Peterson and musically toned by artist Akira the Don. The title of graphic novel "Silent was Zarathustra" by Nicolas Wild is a reference to Nietzsche's work. Thus Spake Zarathustra, translated by Alexander Tille, Macmillan, New York and London, 1896. Thus Spake Zarathustra, translated by Thomas Common, T.N. Foulis, Edinbugh and London, 1909. Gustav Naumann 1899–1901 Zarathustra-Commentar, 4 volumes. Leipzig : Haessel; http://catalog.hathitrust.org/Record/006124821. Higgins, Kathleen. 1987, rev. ed. 2010. Nietzsche's Zarathustra. Philadelphia: Temple University Press. osho. 1987. "Zarathustra: A God That Can Dance". Discourse given at OSHO Commune international, Pune, India. Rosen, Stanley. 1995. The Mask of Enlightenment: Nietzsche's Zarathustra. Cambridge: Cambridge University Press (2nd ed. New Haven: Yale University Press, 2004). ^ The first two parts were published in 1883, the third one in 1884, and the last one in 1891. ^ Gutmann, James. "The "Tremendous Moment" of Nietzsche's Vision". The Journal of Philosophy, Vol. 51, No. 25. American Philosophical Association Eastern Division: Papers to be presented at the Fifty-First Annual Meeting, Goucher College, December 28–30, 1954. pp. 837–42. ^ Nietzsche, Friedrich Wilhelm. "How One Becomes What One Is: With a Prelude in German Rhymes and an Appendix of Songs". (Edition) Random House, 1974. p. xii. ^ Bloom, Harold (1994). The Western Canon: The Books and School of the Ages. New York: Riverhead Books. pp. 196, 422. ISBN 1-57322-514-2. ^ Shapiro, Gary (Winter 1980). "The Rhetoric of Nietzsche's Zarathustra". boundary 2. Duke University Press. 8 (2). JSTOR 302845. Zarathustra does not want to be worshipped himself, and he will be remembered only by continual dance and play which by its very nature must avoid any centering of a privileged object or person. Even the notion of eternal recurrence is treated playfully in a number of ambiguous references to the confusion of times. That a play upon the tropes should end with irony makes the fact of play itself unavoidable but it does not leave much standing in the way of straightforward doctrines or teachings—just as the higher men must surrender their desperately gleaned fragments of doctrine for Zarathustra's dances. ^ a b Nietzsche, Friedrich (1954). The Portable Nietzsche. trans. Walter Kaufmann. New York: Penguin. ^ a b c Nietzsche, Friedrich. Trans. Kaufmann, Walter. The Portable Nietzsche. 1976, pp. 108–09. ^ a b Nietzsche, Friedrich. Trans. Martin, Clancy. Thus Spoke Zarathustra. 2005, p. xxxiii. ^ Bernard Jacobson. "Richard Strauss, Also Sprach Zarathustra, Op. 30 (1896)". American Symphony Orchestra: Dialogues and Extensions. Archived from the original on 2007-10-15. Retrieved 2007-12-11. ^ "Fiction Reviews, October 1, 2011". Libraryjournal.com. Archived from the original on December 17, 2011. Retrieved 2011-11-01. Oil painting and graphic cycle Thus spake Zarathustra by Lena Hades.